We normally don’t do kickstarter campaigns, but we love bamboo and this company has this really unique way of setting up your own bamboo fenders, it’s called the Mandy Fenders. 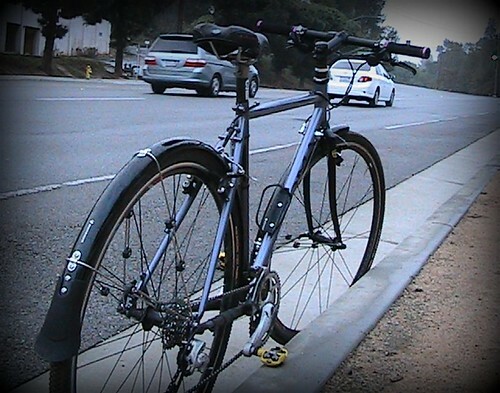 Versatile and interchangeable: The Mandy Fender is the most versatile bike fender ever designed. 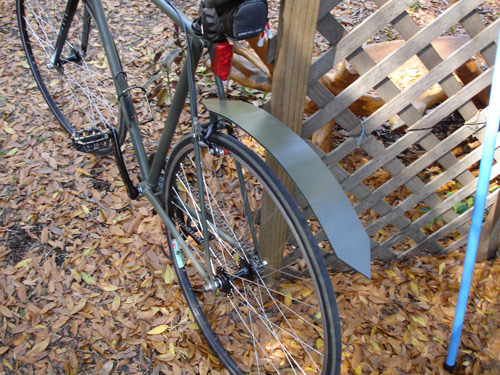 It fits on nearly every type of bike design: You no longer need a different bike fender for each bike you own. Easy to install: The Mandy Fender comes with all the parts and tools you need. With a simple video tutorial and a clear instruction manual, anyone can install the Mandy Fender in 30 minutes or less. Tough and functional: Designed and made from bamboo, the Mandy Fender is light, durable and weather resistant. The mounting hardware consists of both 304 stainless steel and chrome-plated parts. The Mandy Fender is made with a layer of memory film that allows them to retain its shape. It can be reshaped to fit onto a different bicycle using hot air (from a hair dryer). It is also designed to withstand harsh weather conditions such as snow and mud. Do you need your accessories to match? I’ve always been a fan of matching accessories on a bicycle. Take this photo for example. Fenders, racks, pedals, and chain guard pretty much match everything else on the bike. But when I see this, I immediately think that I might worry too much about leaving a beautiful machine at a bike rack at the office where I can’t see it for hours at a time. 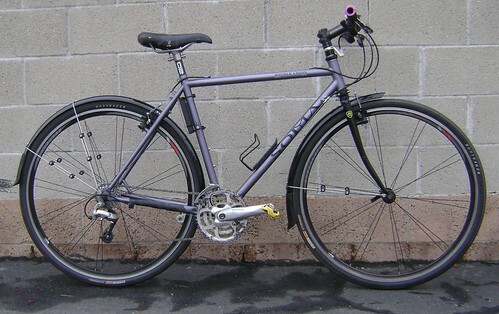 My old Redline commuter bike was unassuming, it had a grey/black color scheme and I even uglified it just to deter thieves from trying to take it. So I’m curious to know what are you thoughts, do you dress up your bike to look as good as this specimen, or do you dumb it down to detract attention from it. 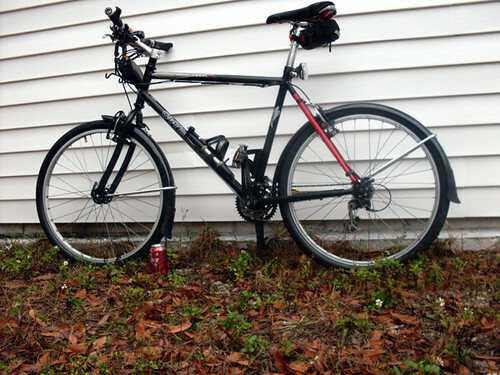 Or perhaps you have a bike like this and you consider it your “going out” bike. 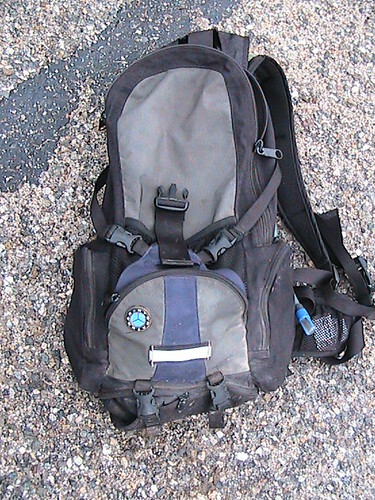 Something you use when you’re out getting coffee or grabbing a bite to eat at the local sandwich shop where you could still keep your eyes on it. The common variety of this bike commuter species is known as a "Skunk Stripe"
Buenos días de Costa Rica once again lindisimos Bike Commuters! In honor of Friday and my stream of consciousness blog-barfing, I decided to muse on the unusual phenomenon that is the Skunk Stripe – prevalent throughout the downhill aguacero commutes of Turrialbeños. As I am (gasp!) 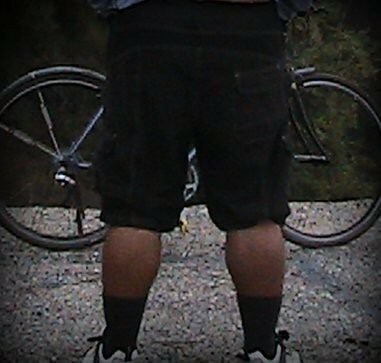 shamefully still bikeless for over a month now, I’ve been forced to commute by foot. However, I’ve turned each bout of foot commuting into an opportunity to practice my new hobby… Similar to the popular hobby of bird watching (a.k.a. “birding” for short), I like to call my newfound sidewalk speculation bike watching (a.k.a. “biking”). 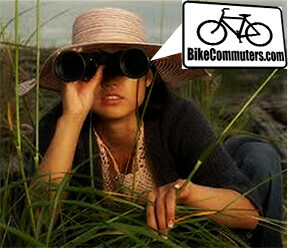 Bike Watching - on the lookout for Skunk Stripes! In my biking adventures here Ive spotted a resurgence of skunk stripe bikes in this rainy season! It seems that fenders here area luxury not afforded by most Turrialbeños… Other varieties of skunk stripes can be seen migrating through the Central Valley this winter such as the yellow-tail poncho, and the umbrella crest. 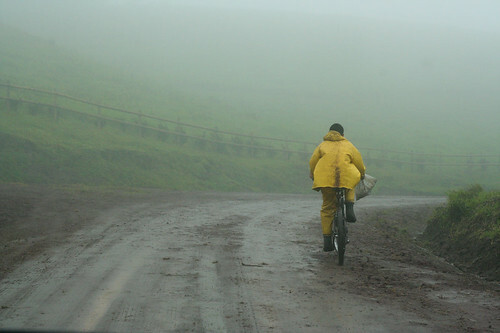 Costa Rican Yellow-tail poncho bike spotted by flostof. And the Umbrella Crest variety captured by gimblett. 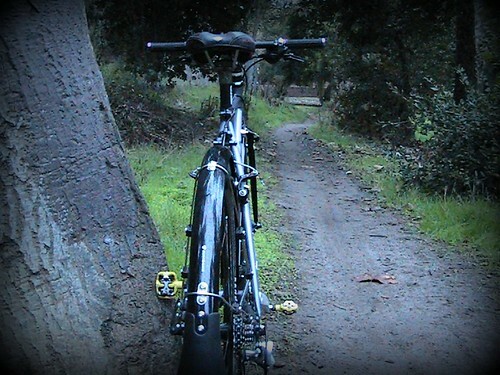 We’ve reviewed quite a few different types of fenders on our site, (see here, here, and even here for rooster tails). So let’s put together a basic breakdown of all things fender fantastic for any rookie winter riders – ticos or otherwise- who want to say adios to the skunk stripe. Let the winter bike commuting begin! DIY Fenders – for the third world countryman in you! For those of us with more time than dimes, check out Ghost Rider’s DIY po-boy Fender project here. DIY Fenders can be customized to fit your needs and can washed away that skunk stripe with some bent aluminum, corrugated plastic, a can of spray paint. 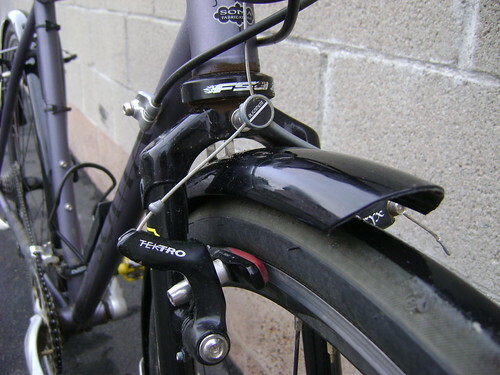 This tutorial is a great option for some road bikes that don’t come with fender mounts built into the frame. 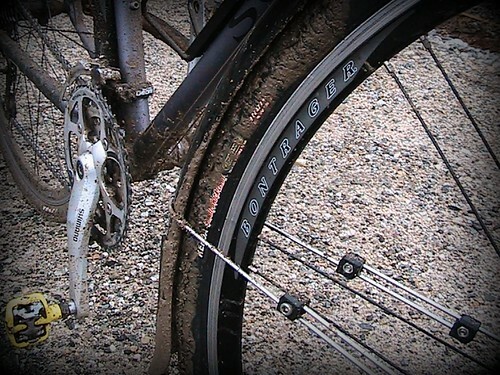 Clip-on fenders could be a good option for muddy commutes or bikes without fender mounts build into the frame. 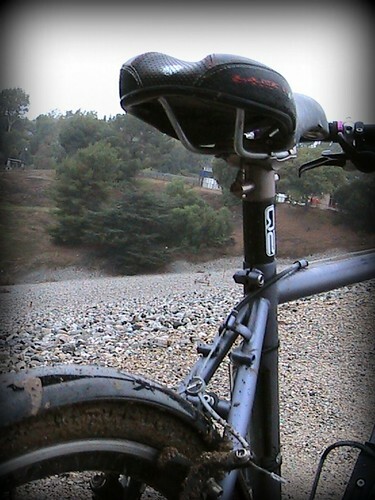 The idea is to protect the rider from the water or mud from the top of the bike: front fender can mount via the steer tube and rear fender can mount via the seat tube. 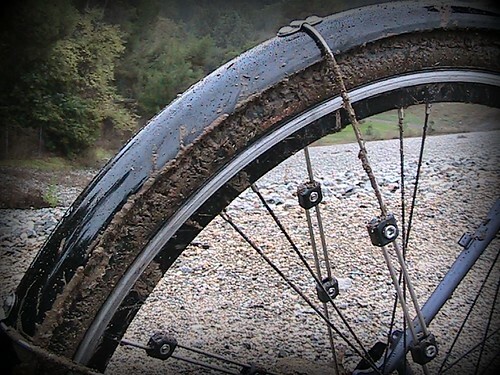 Since there is plenty of clearance between a clip-on fender and the wheel, you won’t have a problem with mud jamming up underneath. Prices can range between $20 -$50 for a set. 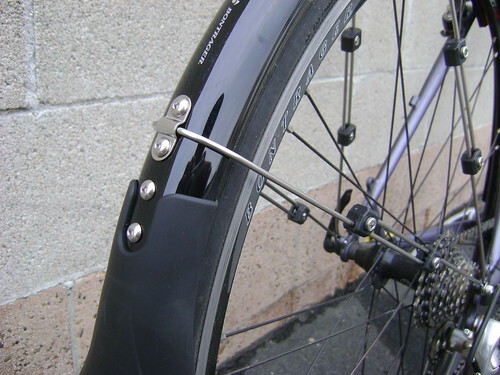 They also make removable clip-ons like these in case you’d like to groom your fender plume regularly. To do away with the skunk stripe on your roadie, take a look at this article for other clip-on options. 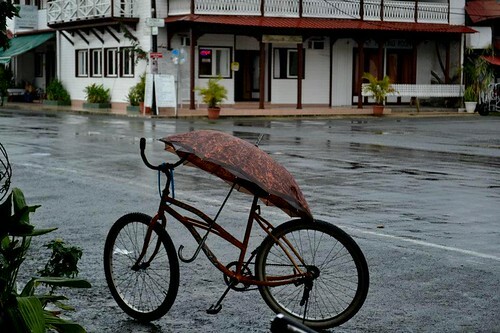 Full coverage fenders get the best coverage for any rider who is encountering lots of rain this season. 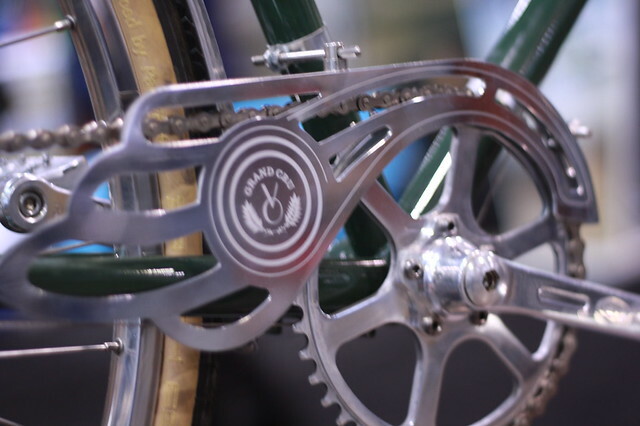 They mount onto fender stays that are usually built in to the frame of touring, hybrid, or bike frames targeted towards utility cycling. 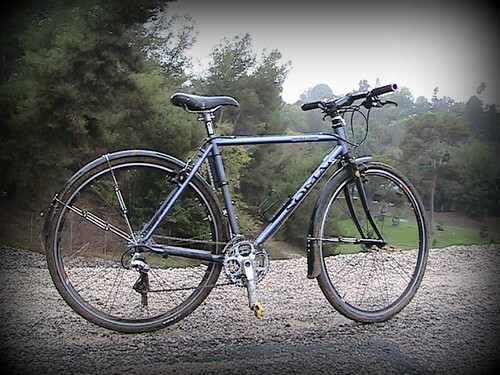 I used to commuter on my Kona Dew with a pair of yellow planet bike full fenders. They kept me dry through the Seattle winter and I was never caught with a skunk stripe like those tricksy hipsterses on fenderless fixies… The only problem with full fenders is they can require frequent adjustments to keep from rubbing on the wheel – if you will be cramming your bike into car trunks or cinching the front wheel on a bus rack, you may be better off with the clip-ons and wet legs. 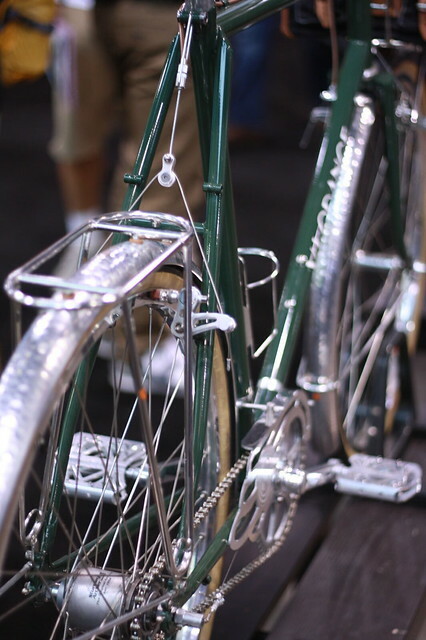 So, dear Bike Commuters, do you rock the skunk or do you skip the stripe with a pair of fenders? Why or why not? Post to the comments box if you have any DIY tips for readers, or other fender ideas to share…! Muse on and enjoy your weekend! Fenders, baskets, chainguards, skirtguards (what IS that!? ), three-speeds, child seats, racks galore, bells, dynamo lights, and kickstands. Sounds like a commuter bike to me, whether you’re towing Costco groceries, kids, or other bikes! These things are the all-in-one package, with more appendages, accessories, and equipment than the actual bike. I’m surprised there’s not a dog-walking leash attached or something. 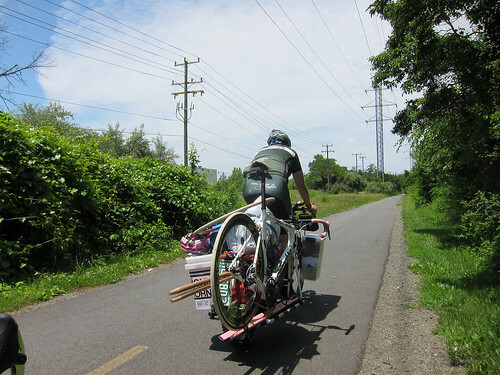 This photo is totally internet ganked... but it is Ultimate Utility Bike COOL! Unlocking The frame mounted lock can be unlocked by simply pushing in the key. 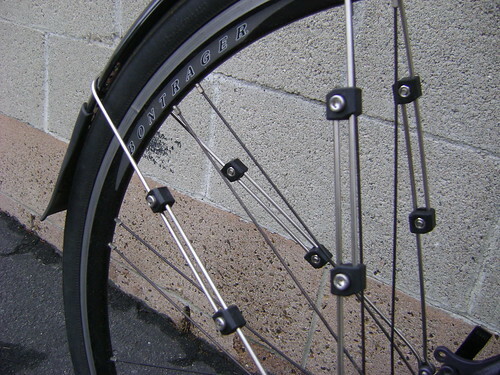 A wire lock has to be untangled from around the wheel, frame and whatever the bike is locked to, potentially dirtying everything in the process. Lights They’re attached to the bike, difficult to steal and don’t require batteries. Have to remember to bring them downstairs and attach them to the bike. Also have to remember to remove them when I arrive at the supermarket lest they get stolen, reattach them after I’ve finished shopping and remove them again once arriving home. Thats a lot of work. Chainguard Keeps everything nice and clean. Have to remember to bring a velcro strap downstairs to keep clothing from rubbing on the chain. Parking Pull in. Kick down the stand. Push a lever to lock the bike. Go shopping. Look for something to lock the bike to, not always easy. Remove the wirelock from handlebars, lock the rear wheel and frame to a solid object. Careful, you might get dirty. Child seat I can take someone for company, or to push the supermarket trolley for me No chance. Basket Holds any amount of groceries I’m likely to buy in one go. Squash groceries into a backpack or hang them from the handlebars which not only interferes with the bikes balance, but is also frowned upon by the law. 5kg of rice? Impossible. 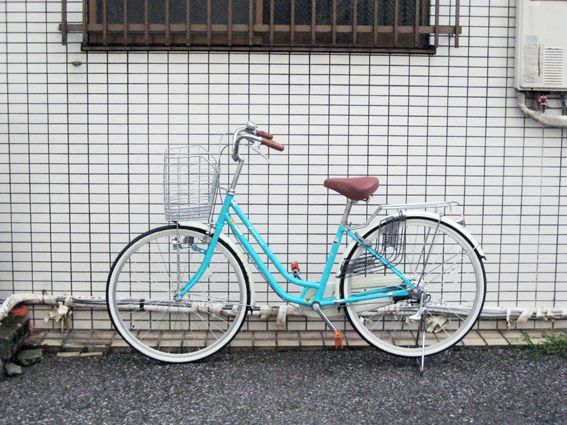 And from the mama bicycle blog (written by a Japanese dad who likes his Mamachari bike and practicing his English) I delved further into the land of cheap, heavy-as-a-bloated-ox utility bikes, and found the Maruishi Cycles Frackers bike! Anyway, I’d like to take a jaunt around my hood with a mamachari! The best part is, you don’t have to be a Mama to ride one either! Anyone seen these types of bike popping up in the USA at your local bike shops? Image taken from Hello Sandwich. This is less "mama"-specific.